This is a the release of Veltro2K's =NEW= Lockheed/Vega PV-1 Ventura USN Patrol Bomber. This represents the early "glass nosed" version as used in the PTO. Although the US Navy skins are tagged for VPB-138, they are representative of pretty much ALL USN PTO Ventura units from Australia to the Aleutians. The RNZAF skins, while tagged for No.3 Squadron, are also fairly representative of NZ units in the SoWesPac regions of the PTO. All markings are decals, and Decal Randomization is TRUE. Serial number/BuNums are accurate for the model depicted, but should be considered 'generic' in nature, as they reprsent no specific unit. Lighting is as accurate as possible, given the lack of pictures of the bottom. Engine sounds, pilot figures, and skin-specific Hangar Screens are included. Weapons, guns, bombs, etc, are NOT; you should have them already. Operational service dates are rounded to 'whole months', and ARE relatively correct for ALL in-theatre usages. on the Aircraft Selection Drop down menu. As different versions are planned, this will help keep them diferentiated, so to speak. This is a the release of Veltro2K's =NEW= Lockheed/Vega PV-1 Ventura USN Patrol Bomber. This represents the mid-production solid nosed, with 2-guns as used in the PTO. Although the US Navy skins are tagged for various VB/VPB squadrons, they are representative of pretty much ALL USN PTO Ventura units from Australia to the Aleutians. Engine sounds, pilot figures, Hangar & Loading Screens are included. Weapons, guns, bombs, etc, are NOT; you should have them already. Operational service dates are rounded to 'whole months', and ARE relatively correct for ALL in-theatre usages. on the Aircraft Selection Drop down menu. As several versions are planned, this will help keep them diferentiated, so to speak. 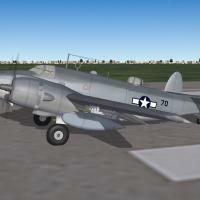 This is a the release of Veltro2K's =NEW= Lockheed/Vega PV-1 Ventura USN Patrol Bomber. This represents the late-production solid nosed, with 5 guns (3 in a 'chin pak' under the nose) as used in the PTO. Although the skin is tagged for VPB-137 (Phillipine based in late 44), it is representative of pretty much ALL USN PTO Ventura units from Australia to the Aleutians. 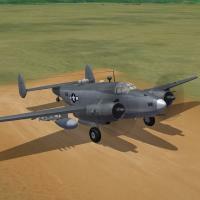 Engine sounds, pilot figures, Hangar & Loading Screens are included. Weapons, guns, bombs, etc, for the most part, are NOT; you should have them already. However, a set of HVAR mounts, the rockets themselves, and the drop tank is. Operational service dates are rounded to 'whole months', and ARE relatively correct for ALL in-theatre usages. This is a the release of Veltro2K's =NEW= Lockheed/Vega PV-2 Harpoon USN Patrol Bomber. Although the 3 tone skin is tagged for VPB-138 (Northern Pacific/Aleutian Islands region), it is representative of pretty much ALL USN PTO Ventura units from Australia to the Aleutians. The DGNB skin is tagged for VP-772, a post-war reserve squadron based at NAS Los Alimitos, California circa 1948. The base blue skin can also be used for several of the other post-war users. Engine sounds, pilot figures, and a 'box art' Hangar Screen are included. Weapons, guns, bombs, etc, for the most part, are NOT; you should have them already. However, a set of HVAR mounts, the rockets themselves, and the drop tank is. Operational service dates are rounded to 'whole months', and ARE relatively correct for ALL in-theatre usages. "A Somewhat What If aircraft for WW2 PTO '46"
The is a semi-what if aircraft, as the BT2D did exist (and was renamed the AD-1 in 1947). 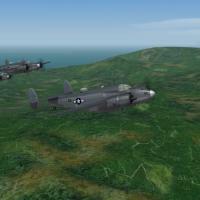 This mod assumes that the aircraft WAS deployed to the Western Pacific in WW2, in the event that the development and/or usage of the A-Bombs was curtailed for some reason. The skin remains in bmp format. All markings are decals and decal randomization is TRUE. All Aircraft carry the new style (post-July 1945) "letter code" ship identification tags. These ARE correct for the time from 7/45 - 12/46(ish). VT88 & VB19 also make use the "hundreds" series modex numbers, which also started usage 7/45. VB14 remains with is double digit modex numbers. Several other ship ID code decal are provided, for those wishing to replace other SB2C & TBM units with the BT2D. Other units can be easily made if one knows their code letters (I do!) Other units may require new, different sequenced modex number decals. All weapons, sounds and a pilot figure are included. The canopy opens with the standard keystroke, Shift/0 (zero). Wingfold is active, by using it's standard keystroke, Shift/9, but it's not reccomended to fold the wings when loaded, as due to some sort of game limitation, the weapons will NOT move with the wing (no matter how much I've tried to fix that). The aircraft has been given a "start date' of of June, 1945. The aircraft is equipped with radar, (AN/APS-4) in an external pod, and is speced to carry and deploy just about all USN weapons of the period, including "Bat" glide bombs, and torpedos. 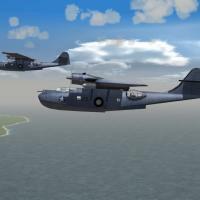 This is a Re-release of the Veltro2k's WW2 PBY-5A Catalina flying boat patrol bomber aircraft. While the Game Engine  dosent support amphidexterious operations off water, the wing floats extend/retract with the H (arrestor hook) key. This pack contains just the single skin, USN42. 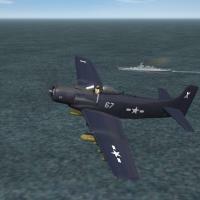 This is a rather 'generic' skin, and represents USN VP squadrons from approximately May 1942, when the red ball and rudder stripes were removed. This also -more or less- coincides with the the arrival in greater strentgh in squadron service, of the -5A amphibibian version (which this is), replacing the -4 and -5 seaplane only variant. For those that still have the original releases, you SHOULD redownload this pak; . There HAVE been MANY changes and additions in several of the inis, in respect to SF2NA.